In which innovation and the number of contributors appear inversely proportional. In the wake of songwriting giants such as the Beatles, Carole King, and Randy Newman, the 90s and 2000s saw composers and songwriters diminishing in stature. Rather than songs being a collaboration between one songwriter (or one composer and one lyricist) and competent performers capable of performing their songs in front of live audiences, more of the songwriting was done by several people bouncing ideas off one another, with several producers manipulating the arrangements and audio production, and inept performers having their errors fixed by computers. 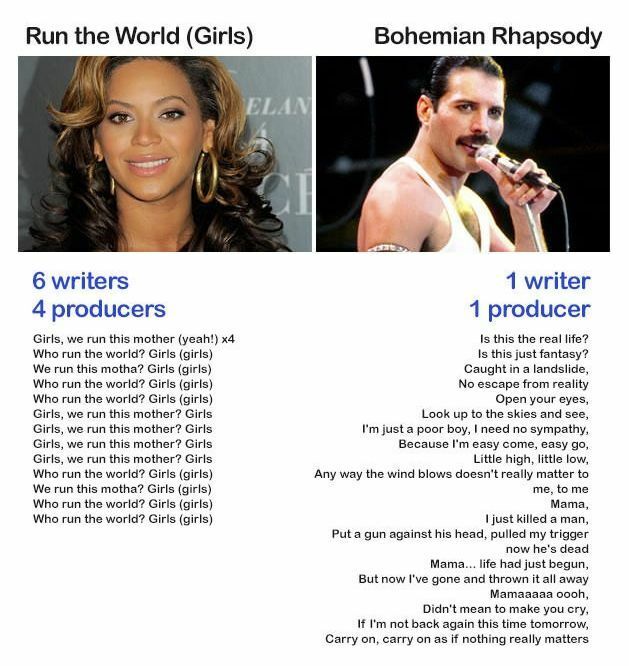 There is nothing inherently good or bad about either approach, but the collectivist contribution Lanier discusses is mirrored in the newer, collective songwriting process, including the songwriting of Beyonce’s “Who Run the World”. As an ardent feminist, I wholeheartedly support the message of Beyonce’s song. Nevertheless, the generally unremarkable nature of the song (both lyrically and musically) suggests that, with so many people’s opinions at play, one of the only things they could agree on was the titular line. It’s possible that, with only one songwriter and one producer, the result wouldn’t have been any better, or might even have been worse, but I suspect that, as Lanier believes about the internet, with fewer contributors, the result could have at least been more interesting.